Strain 7 KIPT (= DSM 43043 = ATCC 23552 = JCM 3097) is the type strain of the species Intrasporangium calvum, which is the type species of its genus Intrasporangium [1,2]. The generic name derived from the Latin word intra meaning within and the Greek word spora meaning a seed. 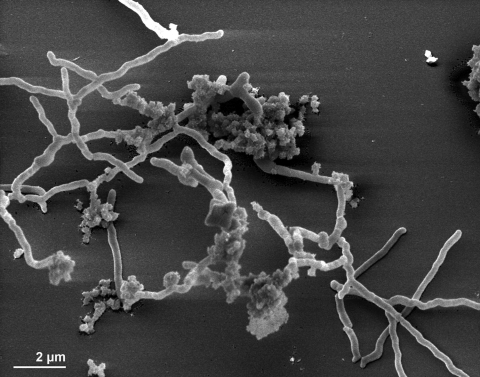 The name Intrasporangium, was selected to emphasize the possibility of intercalary formation of sporangia in mycelial filaments . Intrasporangium is the type genus of the family Intrasporangiaceae and one out of currently nineteen genera in the family Intrasporangiaceae [4-6]. Strain 7 KIPT was first described in 1967 by Kalakoutskii et al. as an airborne organism, which was isolated under nonselective conditions on plates of meat-peptone agar exposed to the atmosphere of a school dining room [1,7,8]. I. calvum is of particular interest because the type of its menaquinones is different from all other representatives of the family Intrasporangiaceae . Here we present a summary classification and a set of features for I. calvum 7 KIPT, together with the description of the complete genomic sequencing and annotation. 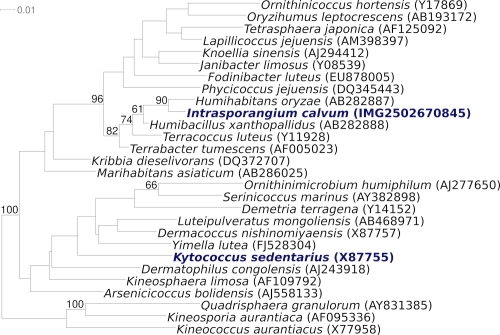 The 16S rRNA gene of strain 7 KIPT shares 92.6-98.7% sequence identity with the sequences of the type strains from the other members of the family Intrasporangiaceae , with Humihabitans oryzae as the closest relative. The 16S rRNA gene sequence of 7 KIPT is 99% identical to the uncultured Intrasporangiaceae clone HT06Ba24, isolated from soil of a former coal gasification site in Gliwice, Poland [10,11] and AKAU4164, isolated from uranium contaminated soil in Oak Ridge, USA [10,12]. The environmental samples database (env_nt) contains the marine metagenome clone 1096626841081 (AACY020552144) from surface water (92% sequence identity with 7 KIPT). 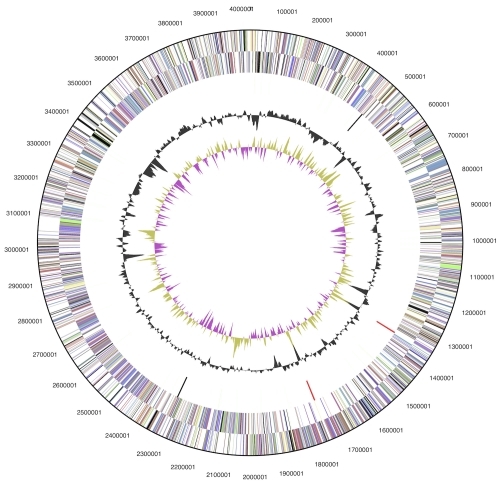 The genomic survey sequences database (gss) contains the metagenomic clone 1061002660518 from Floreana island in Punta Cormorant, Ecuador , which shares 93% sequence identity with 7 KIPT (as of July 2010). One of the 16S rRNA sequences of strain 7 KIPT was compared using NCBI BLAST under default values (e.g., considering only the best 250 hits) with the most recent release of the Greengenes database  and the relative frequencies, weighted by BLAST scores, of taxa and keywords, weighted by BLAST scores, were determined. The five most frequent genera were Janibacter (29.6%), Terrabacter (19.8%), Sanguibacter (8.4%), Dermacoccus (7.7%) and Tetrasphaera (6.2%). The five most frequent keywords within the labels of environmental samples which yielded hits were 'skin' (9.1%), 'human' (4.7%), 'microbiome/temporal/topographical' (4.5%), 'sludge' (4.4%) and 'heel/plantar' (3.1%). The single most frequent keyword within the labels of environmental samples which yielded hits of a higher score than the highest scoring species was 'contaminated/soil/uranium' (33.3%). I. calvum 7 KIPT was grown in medium 65 (GYM Streptomycetes medium) supplemented with one third of BHI (medium 215)  at 28°C. DNA was isolated from 0.5-1 g of cell paste using Qiagen Genomic 500 DNA Kit (Qiagen, Hilden, Germany) following the standard protocol as recommended by the manufacturer, with modification st/LALMP for cell lysis as described by Wu et al. .
We would like to gratefully acknowledge the help of Gabriele Gehrich-Schröter for growing I. calvum cultures and Susanne Schneider for DNA extraction and quality analysis (both at DSMZ). This work was performed under the auspices of the US Department of Energy's Office of Science, Biological and Environmental Research Program, and by the University of California, Lawrence Berkeley National Laboratory under contract No. DE-AC02-05CH11231, Lawrence Livermore National Laboratory under Contract No. DE-AC52-07NA27344, and Los Alamos National Laboratory under contract No. DE-AC02-06NA25396, UT-Battelle and Oak Ridge National Laboratory under contract DE-AC05-00OR22725, as well as German Research Foundation (DFG) INST 599/1-2 and SI 1352/1-2, and Thailand Research Fund Royal Golden Jubilee Ph.D. Program No. PHD/0019/2548' for MY. Holt JG, Krieg NR, Sneath PHA, Staley JT, Williams ST. 1994. Bergey's Manual of Determinative Bacteriology, 9th ed. Williams & Wilkins, Baltimore. Classification of bacteria and archaea in risk groups. TRBA 466.